A short history of a school children's strike against against racist and substandard education at Robert Russa Moton High School in Prince Edward County. It was time that Negroes were treated equally with whites, time that they had a decent school, time for the students themselves to do something about it. There wasn’t any fear. I just thought—this is your moment. Seize it! The protest led to a court case that became one of five cases that the U.S. Supreme Court reviewed in Brown v. Board of Education of Topeka when it declared school segregation unconstitutional. 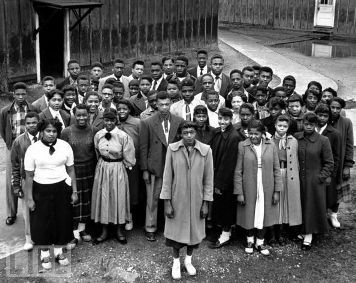 Rather than desegregate, on June 26, 1959 the Prince Edward County, VA Board of Supervisors refused to appropriate money from the County School Board to the public schools. This refusal, which continued for five years, was part of the Massive Resistance Movement, and effectively closed the doors of the county’s schools. During these years black students were forced to find education wherever they could and white students attended new segregated private schools, the last of which began to accept black students in 1986.